Greetings to all of you and Happy Holidays! 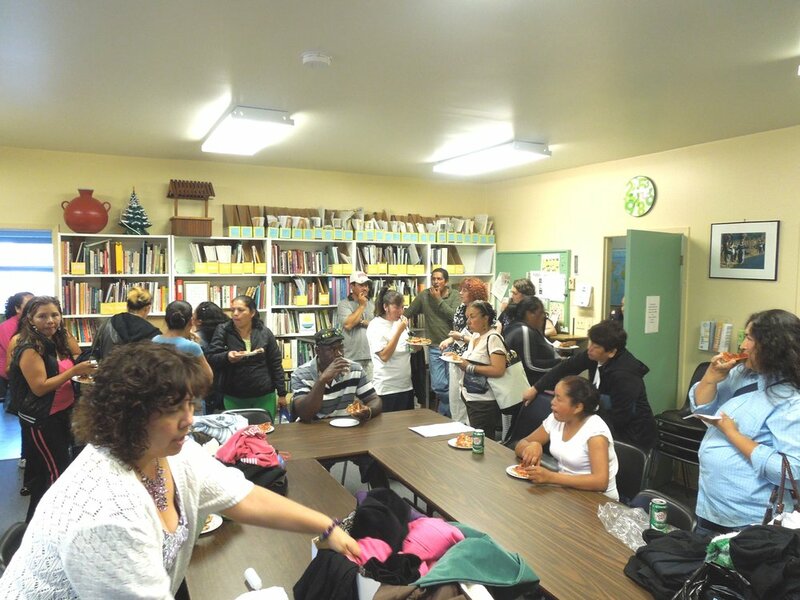 Migrant workers enjoy a snack at Horizons before attending Health and Legal Clinics. At this very special time of the year, we have so many things for which to be happy and grateful. We reap our personal “harvest,” whatever that may be. It occurs to me that all of us – in a very individual way – are farmers. We plant the seeds of wishes, hopes, and dreams, and watch them grow into something tangible as we go through our daily lives. And just like in the planting cycle, we experience challenges along the way. There are periods of happiness and heartache, abundance and loss. Even when our lived experiences are incredibly different, as they are between people in the North and people in the South, our shared human experiences are very much the same. Deep down we all desire to be loved, be productive, contribute to our society, care for others, and share what we know. Hope for the future: A new generation learns about sustainable agriculture and seed collection from their parents. It is that sense of humanity that informs Horizons’ work, whether its providing ‘pockets of hope’ through our many partners and programs in Mesoamerica, or assisting migrant workers here in Canada. We never forget that the individual is at the core of all we do. When you donate $50 or $100, or more, you are supporting real people with real needs. People like Victoria, a 48 year old migrant worker from Tuxtla, Mexico. With no possibility of finding a job at home, Victoria was happy and grateful to come to Canada to work. But like other migrant workers, it was at great personal sacrifice. She had to leave her five children back home with family. For eight months! You can imagine how difficult that was. She missed them deeply and “lived the family” through phone calls. Victoria also had to contend with feeling as though she did not belong, of being looked at as “different” or “ not one of us.” This is a common experience for both migrant workers and new immigrants to Canada. At Horizons, we understand the migrant workers’ struggles to fit into our communities, to overcome social isolation and language barriers. Each year, we meet hundreds of workers, male and females, from Mexico, Guatemala, Jamaica, Barbados and Trinidad and Tobago, who help put local fresh food on our tables. To ease their transition, Horizons has developed a very multi-faceted program. It allows them to find human companionship, take part in activities that make them feel welcome, attend health clinics and legal counselling clinics, and share their stories. Donor dollars support innovative projects, like textile workshops, that help communities deal with challenges they face. Those stories become a part of our lives. The experiences of Victoria, Maria, Saul, Marco, Felix, and the rest – their struggles back home, the sick child, a daughter’s sadness because she misses her mom – deeply touch our hearts. The migrant workers have returned home now for a joyful reunion with their families. They tell us they are grateful for the support from Horizons, and for you our donors who make this work possible. They also are grateful for the opportunity to earn income to help provide for their families. For many of the communities Horizons works with, these opportunities do not exist! Our partners and projects help marginalized communities develop innovative ways to meet the daily challenges they face. Women are able to receive small micro-credit loans to start small businesses to support their families. Youth can participate in dance and theatre workshops, helping them gain the self-esteem and confidence to strive for their goals. Farmers have nutritious food to feed their children through technical workshops that improve their soils. All of this is possible because of you, our loyal donors. You understand that we should all be able to plant seeds of hope and work to see them grow to fruition. As we experience that magical peacefulness of the first snowfall, I ask you to reflect on the blessings you have harvested in your own lives. As you prepare to embrace the spirit of the season and share holiday joy with family and friends, please generously consider your extended family in the South. I invite you to support our brothers and sisters struggling in their communities in Central America and Mexico, and to support those who spend a short time with us, working to provide the bounty you will share with loved ones at your table. By making a gift of $25, $50 or $100 today you are planting seeds of hope and blessings for their future! I thank you for your generosity and commitment. On behalf of Horizons’ Board of Directors, volunteers and staff, I offer you our best wishes for a joyous holiday season and a peaceful 2017. Mexico. Join our monthly donor program, “Circulo de Amigos” (circle of friends). Just call 1-888-729-9928.